Joy to the World (Jeremiah Was a Bullfrog) composed by Hoyt Axton. Arranged by Jeff Funk. Choir Secular. SATB choir. Choral Octavo. Secular. Choral Octavo. 12 pages. 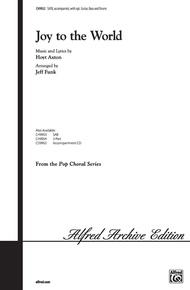 Published by Alfred Music (AP.CH9952).The group Three Dog Night's hit song "Joy to the World" is familiar to millions who grew up with the music of the 70's. Jeff Funk brings us this fun-filled arrangement!Recorded Acc. Available.